In 2013, a planning application was submitted by consultants on behalf of the owner, The Revelstoke Trust, for the refurbishment and alteration to the Castle and all the estate cottages and the Whitehouse, together with new infrastructure works. This comprehensive proposal was granted consent in the early Summer. It is a 10 year programme aimed at making the Island financially sustainable. More recently a particular aspect of the the case, centring on the proposal to convert a Lutyens castle extension bedroom to a bathroom, was referred to the Planning Appeals Board, who upheld the original application. A visit by Lutyens Trust members to the island took place in the Summer. An application for conversion to a hotel was consented in the Spring. This had, in fact, been given consent in a previous application in 2011. Work may now be at a stage where a visit could be made and the owners have agreed in principle for when the works are further advanced. The house was bought by a Bradford family in 2013. They have received consent for internal alterations and the addition of a new service entrance porch (extending the existing entrance). The Planning Authority has granted the consent with 17 Conditions covering all the contentious aspects. Final drawings must be submitted to the Council for approval of these aspects. These will be publicly advertised and the Planning Officer will notify the Trust when the Council receives applications for lifting of Conditions. No applications have been received yet. There is a proposal to build 46 houses on a green field site on a hill overlooking Stockbridge . This would be visible from Marshcourt. It would impact on the setting of the house and garden. The application was refused Consent and an Appeal is likely. A new group has been established by Avoch Museum to gather funds and restore the site. There is an avenue of trees and a carriage way leading to the site which is under forestry repair. There is no progress on planned restoration. The original design had a standing cross over the gate. A very striking effect lost by the setting of the cross in recumbent form at the centre of the circular burial ground. If this was the wish of the family or a later safety measure may not be known until research is done in the Fletcher family papers. From the Lutyens Trust point of view it would be good to restore the cross to the original position. These gates, between splendid stone piers, lead through the park to the War Memorial (1923). Leicester City Council are promoting a project to restore them. They appear to be in a mixture of cast iron and mild steel which is badly rusted . The Trust offered support to this effort and have now been asked to provide a letter of support for the Council’s Heritage Lottery Fund bid. The new roadworks – a combined Australian and Conseil-Général de la Somme operation diverting the road and making it lower in the landscape – have just been successfully completed – creating a new, safer entrance to the site with a subtly landscaped carpark, located to the south of the entrance pavilions, and with a green sward replacing the old road location and with a hedge barrier, largely concealing passing traffic. There is now a proposal for a new visitor centre – to be completed by 2018, a small, discreet building of some 800 metres square – its location to be determined. At a meeting with the Office of Australian War Graves, it was suggested that this might be located behind the tower. The Trust suggested that it could be more appropriately sited adjoining the carpark. The subject will be discussed between all the parties concerned, including the Lutyens Trust. Increased visitor numbers at Thiepval have led to a proposal for a 360 sq.metre extension to the Thiepval Visitor Centre, with an approved budget of €1.0m. No plans are yet available but the site and the maximum permitted height look acceptable. The building is expected to be completed in Spring 2016. The proposal to UNESCO for inscription of a region of cemeteries and memorials in France and Belgium in the list of World Heritage sites is in progress, for submission in January 2016: a decision is hoped for in 2018. The Commonwealth War Graves Commission are also considering proposals for recreating unexecuted planting schemes of Gertrude Jekyll and perhaps lost later in alterations. 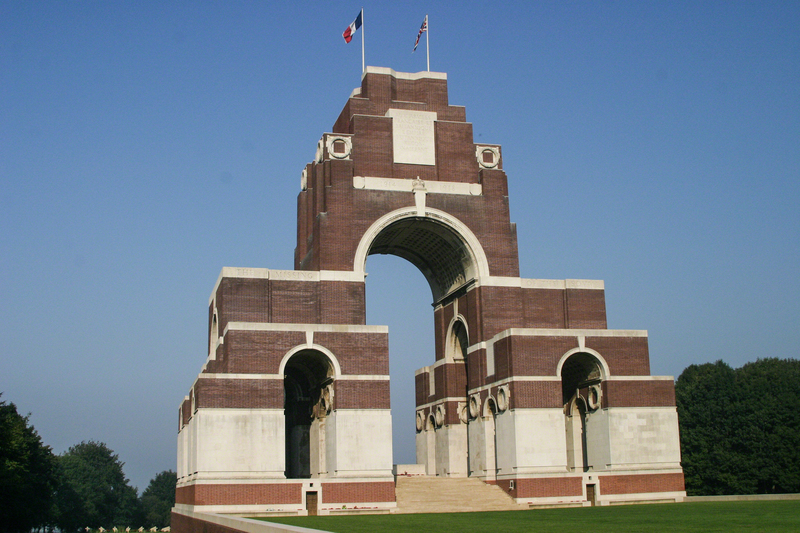 The Trust has been pressing for Lutyens’s long lost low walls and yew hedges to be reinstated at Thiepval. The National Trust have invited the Trust to visit the Windsor end pavilions to discuss their proposals to mark the Magna Carta year 2015. We will be looking at the inside of the riverside pavilion which is said to be an (almost) perfectly preserved cottage originally designed as the Warden’s dwelling. We are especially interested in the problem of the (very busy) A308 running between the pavilions and the growing issue of impact of car parking on the meadow landscape. A developer has sent an outline of a proposal to build 6 houses on a site abutting the garden . We last visited the outside of the house when proposals were viewed for a new garage beside Tigbourne Cottage (once part of the Horne estate). A new visit will be made to view the impact (if any) on the house and garden.